I have met one other person in my life who shares the same little fascination that I do. Well, I think she considered hers an “obsession” but let it be known that my intrigue with this subject is just a fascination. To some of you who might read my blog regularly this might not come as too much of a surprise as I have subtly alluded to it a couple times before (here and here), but many others might find this interest of mine a little weird, and yes, maybe a little twisted. For at least 20 years of my life, I have had a fascination with cemeteries. It started when my grandma took me on annual Memorial Day trips to Mountainview Cemetery in Walla Walla, Washington, to visit our departed relatives and past parish priests. As time went on and I visited more cemeteries my level of interest grew and grew. 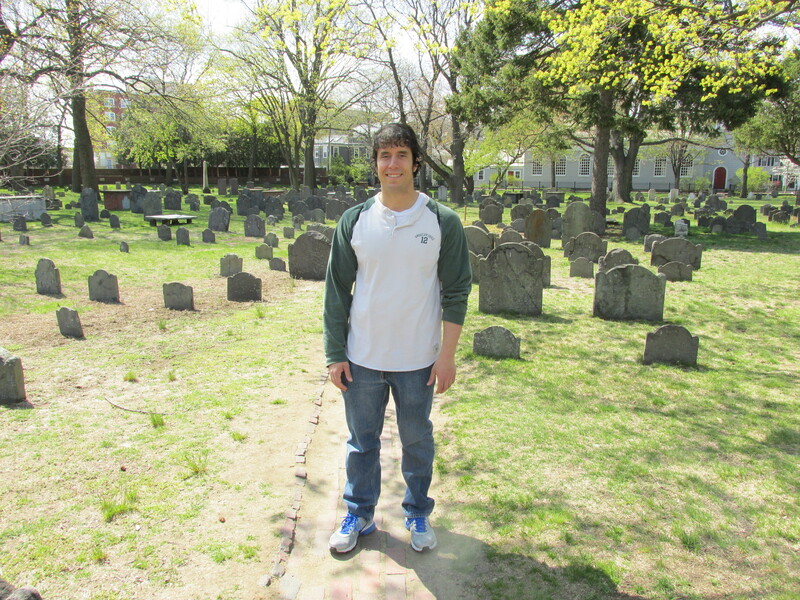 Myself in a very old cemetery in the Harvard District in Boston. The first reason why I appreciate cemeteries so much is just because of the history. I am a major history buff and I love it even more when I can experience it hands on. Going to a graveyard and having the opportunity to walk from tombstone to tombstone and see the dates, inscriptions, and pictures really paints a vivid historical picture in my head. 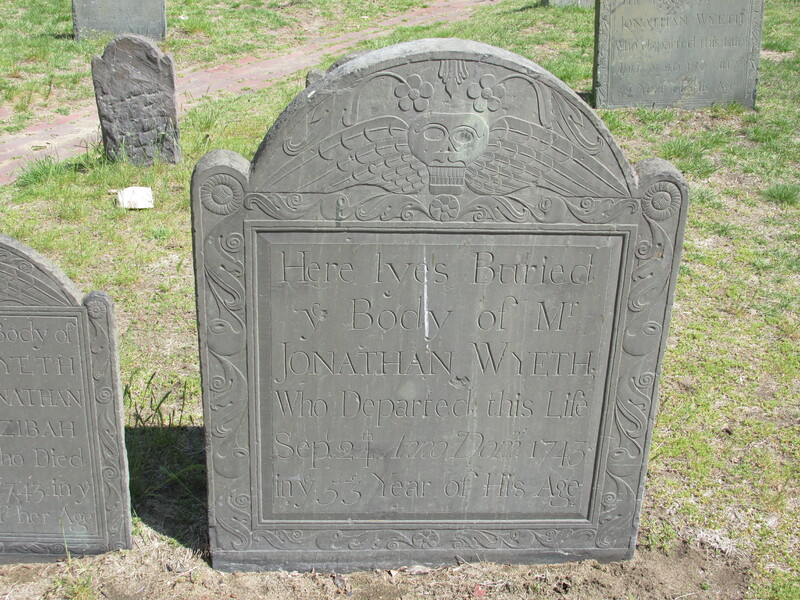 When I went to Boston last month, I got to view grave stones that were 300+ years old! The language and symbols depicted on the monuments were completely different than today and it was just pretty cool. Getting to reach out and touch something over three centuries old seemed to teleport me back to the revolutionary years in our country. But even modern cemeteries have this historical element. I like nothing more than to visit a cemetery and find a tombstone of someone who was born in 1898 and died in 2001. Just looking at “1898-2001” seems almost surreal like. Thinking about everything that person lived through in three different centuries always gets my head spinning. A very old tombstone in a Boston cemetery. This is probably my “weird” reason for liking cemeteries so much but I can’t get over the somewhat overwhelming feeling of walking above the ground where thousands of people have been laid to rest. Don’t you see where I am coming from with my “overwhelming feeling” talk? To think that I get to trot six feet above where people are resting in their coffins rattles my mind a little bit. I can’t help but think what it would look like if my eyes could see through the grass and dirt as I scanned the whole grounds. Thousands of different caskets of different colors, different designs, different eras, and different shapes all lined up in close quarters. Then to think about the remains of the people in those coffins combined with what clothes they were buried in and what jewelry/rings/pictures/trinkets they took with them always makes me just really reflect on that particular earth that I am walking on. When I think about everything that lies underneath my feet when I stroll through a cemetery I never need a reminder to be on my best behavior. Thirdly, I like graveyards because they are just so peaceful and reflective. They are sad too, but I think that adds to the reflective part. I can go to a cemetery and my thoughts are just so much clearer and I become so much more connected to everything around me. I definitely feel the energy of the dead underneath my feet and it just really helps me to appreciate life and to not take it for granted. I will never forget the feeling that engulfed my whole body when I set foot at Arlington National Cemetery. I was definitely not prepared for the multitude of white tombstones and solemn people walking around. When I finally gathered myself, I just felt so lucky and so spoiled that I never wanted to waste another second of my life again. Despite never feeling shy to visit a random cemetery for my own historical and reflective purposes, I also like to visit the ones where I have loved ones buried. To have a location to visit the deceased who loved us so much is a great blessing, one that I will definitely take time to think about this Memorial Weekend. Don’t Blink. This entry was posted in Uncategorized and tagged Arlington National Cemetery, Boston Cemeteries, Cemeteries, graveyards, Mountainview Cemetery in Walla Walla, obsessed with cemeteries, Walla Walla by brent. Bookmark the permalink. I have a fascination with cemeteries as well. I don’t find it weird or twisted in the least. I find them sad, lovely, mournful, and places of reverence. The history of many cemeteries especially in the South, is incredible, and beautiful. Thanks so much for reading and commenting, Traci. I am glad to know that there are other people with my fascination too. Hope you are doing well…I am coming to Vegas again this Sunday. Don’t Blink. Finally, someone else who shares this fascination. My sister and I enjoy looking at the tombstones then heading to the local library and researching who they were and what they did and how they lived. I am the same way its nice to see im not the only one. My family thinks im crazy. But I think I am at the most peace standing on that Holy ground. I wonder what was their lives like what knowledge did they take with them. What secrets did they take? What would they think of our world today? I would love to visit the Boston cemetary you went to I love the picture I zoomed in to see all the details. I wish I could lay flowers on every single persons grave. I try to lay at least one flowers on every person I stop to look at out of respect. And also who knows if anyone even visits them anymore. It makes me so sad to think of people put in the ground and never visited. We can not forget our ancestors we would not be here if not for them. Im trying to trace back all my families as much as possible so I can find them and visit them. Yesterday for the first time I found and visited my Great Great grandparents and one of their daughters. I cried it was overwhelming to know because of them I am here. I am writing an article on the need for seats for graveyards in Ireland and I would like to quote from some of your posts. Hi Mattie – Go right on ahead. I can relate to this kind of fascination too. Another interesting/sobering thought is that we will someday be on the other side of this fascination – others may have a similar fascination about us. Our casket will be a part of all those colors, designs and eras that now fascinate us. We will be far from our loved ones, and yet only 6ft away from the living. I have a love of cemeteries too! People think I’m odd and morbid. I love the history. I think it’s fascinating to see how long someone also lived. I was once in a cemetery that had a mailbox in the middle of the cemetery. I doubt anyone there is going to mail anything. That same cemetery also had an outhouse. I hope to someday own a small cemetery and join a cemetery restoration groups to help with the upkeep of the very old ones. Hi Jennifer – Thanks for the comment. Do you live in an area with interesting cemeteries? I knew there had to be more people like me out there that feels the same way about cemeteries. What I love is how peaceful it is and looks and like you said thoughts are like more clear. Something I want to do and havent done yet is sit down and write but on a nice sunny summer day.